Pretty painless indeed. Real life intervened and I couldn't manage to integrate save games, but YarnSpinner comes with a default implementation that will fill the gap well enough to handle testing. The number of assets I'm leaving for later is beginning to become worrisome, but the script is now the last part of the game that doesn't really exist in any form yet. Tomorrow and the next day won't have as much uninterrupted time as I would like, but I think it'll have to be the case that all the writing done by then is all the writing that ends up in the game, or there won't be enough time left over to both integrate the main mechanic and make the whole thing presentable. Oof. Days 5 and 6 were rough, and I switched back and forth between five different tasks and accomplished a lot of nothing with all of them. The one good thing that came out of it is some high-level insight into how I want the story to go -- I started this project mainly to explore the game mechanics, but now the story is finally to the point where I want to tell it on its own merits, and hopefully that'll express itself in the form of an easier time writing. Tiled/Tiled2Unity handle the collision more or less automatically, so except for a few stumbles on my way up the Unity learning curve, movement was simple to implement. Map loading/unloading was slightly more complicated, since I wanted it to be dynamic and asynchronous (mostly for the principle of the thing; I could probably fit the entire game in memory no problem), but AssetBundles make that possible without having to shoehorn a prototyping/testing solution into production code. The dialogue engine isn't quite finished yet, but the integration with YarnSpinner looks like it'll be painless; once that's done, all that's left is modifying its persistent data storage to include the other game settings and writing the whole thing into a file to implement game saving, and this side of the engine will be complete. Well, so much for that. I made some progress in terms of actually nailing down the plot, but not much of it translated into words on paper, so hopefully I can make up the difference tomorrow. * around 4 or 5 songs that play in the rhythm engine. I'd really like these to be original compositions rather than third-party assets for two reasons: from a pragmatic perspective, that will make the dynamic elements of the engine much easier to integrate; and from a narrative perspective, these songs are representative of the player character's memories (and will even be playing diegetically in some cases) and I'd like them to be as evocative and well-matched to their locations as possible. * a few more songs for background music during the RPG segments, which will probably be third-party assets just to save time since they'll be intended to fit very general sorts of settings. * no more than 15-20 maps for the RPG segment thrown together using third-party assets; these are my lowest priority, since there's not going to be a ton of interaction with the environment, so they'll mostly be static scenery that conveys the location that conversations are taking place. * about 5 distinct character sprites with several expressions for use with the dialogue system; this is what concerns me the most right now, since I can't draw particularly well at all, but I don't think sprite animations on the map a la Final Fantasy V will suffice to get across the range of emotions I want characters to express. The old brain fog has hit me and goofed things up considerably but I'm still in it to win it and not even too horribly behind schedule yet; more tomorrow, with luck. My First Game Jam: Winter 2018 community · Replied to m.zadz in [Devlog] Does It Remind You Of When? Yes! Deemo is one of my favorite mobile games, and I think it's really interesting from a "holistic" game design perspective how it makes a relatively simple engine work through great songs and atmosphere. My First Game Jam: Winter 2018 community · Posted in [Devlog] Kyaa! I'm Late for School! A "guilty pleasure" game is good, too, and leaning really hard into the "anime tropes" idea for some goofy fun makes the Nanaca Crash nostalgia hit hard, so I say go for it. I didn't get it from the initial description, but now that I've seen it in action this looks like it could be a really cool mashup of genres, especially in a puzzle game where you can change up the goals on a per-level basis to reward deep understanding of all the functions and what they do. As far as randomization goes, Tetris The Grand Master has a system that strikes a nice balance between unpredictability and usefulness, so you might find its algorithm useful. Ghost Trick and Virtue's Last Reward are both on my short list for "best game I've ever played", and the twist seems like it leaves a lot of room for interesting puzzles and story alike, so I'm super hype for this. This art is unbelievably charming, and the ideas from your brainstorming look like the makings of a really well-themed game, which IMO is essential to make a platformer interesting. Keep up the good work. User input works now; the notes just blink out of existence, but that'll get fixed in a later pass along with all the other terrible VFX (which is also the reason this is a GIF rather than a video with sound; trust me, though, the song is playing). Audio/visual synchronization will have to be done manually on a per-song basis, which is why the notes don't reach their receivers in time with the receivers blinking. The power bar in the center increases on successful hits, with a higher increase for a more accurate hit, and decreases with misses; in the larger context of the game, the power bar is what you'll use to activate attack and defense abilities that add notes to the beatmap and serve as the 'combat' part of the combat system. Slow day apart from that; I fiddled with tilesets and map building, dialogue display, and writing, but don't have anything that makes a particularly exciting screenshot. The plan for tomorrow is plotting and writing, so hopefully that goes well enough that I have a big goofy dialogue hairball in Yarn to show off with. Didn't even take me all day, either. This is with hardcoded... lots of things, but I've got a pretty good idea of how the song data should be stored, so I'm going to spend the rest of today getting a few more test songs and writing beatmaps for them, and if I'm lucky I'll have a very minimal display engine finished (except for swapping in some art assets that aren't quite as extremely ugly) by the time I get to sleep. Then tomorrow, the plan will be to get input working, and that will give me the rudiments of a working play engine, and I can switch over to the RPG/story side and get a few things nailed down before coming back to work on the special mechanics that are the gimmick of the game. Sounds great. Magic/science mixing and protagonists that don't do traditional 'combat' are some of my favorite themes, and I can imagine a lot of fun directions you could take the 'information gathering' in. I was just thinking "ooh, like Papers, Please" and then you mentioned that in a reply, haha. I really love that style of storytelling and I feel like it's underused even by indies, so color me excited. After doing some very basic mockups just to get used to Unity's interface, I spent most of today trying to figure out how the various engines are going to work; after some helpful tips from the lovely people in Discord, I decided to use wwise to manage audio, YarnSpinner for managing dialogue, and Makinom for the RPG elements. 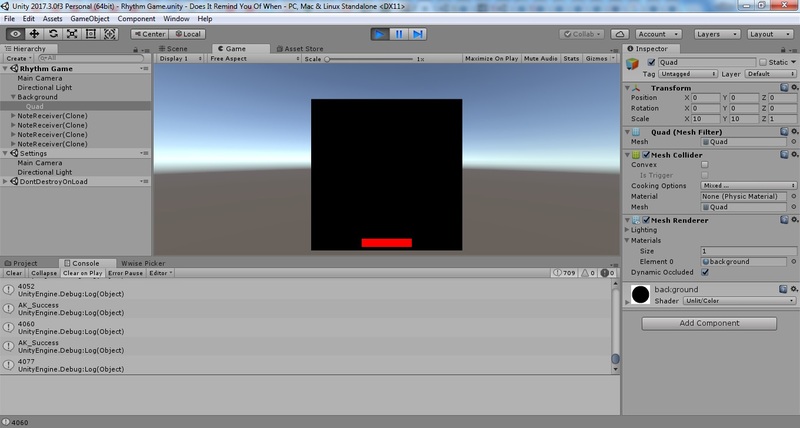 Because my first priority is the rhythm game engine, and my number one worry is that getting audio and visuals to sync reliably will be a difficult process, the rest of the time I spent today was on getting music playing, and being able to determine how far the music track has progressed; what you see in the picture above is Unity's Debug.Log telling me how far my test song has progressed in milliseconds (and that it is, in fact, still playing), so with luck, I'm on track to have notes start falling in sync to music sometime tomorrow. My First Game Jam: Winter 2018 community · Created a new topic [Devlog] Does It Remind You Of When? I'm glasnost, and I'll be working on Does It Remind You Of When? (henceforth DIRYOW?) for this game jam. I've done a few non-game jams and have a fair amount of programming experience, so that'll be my focus here, with my number one goal for the jam being just to get used to C#/Unity (which I've never used before); if I manage to get a game out of the experience, so much the better. Any feedback you have on anything you see here would be welcome -- I've tooled around with art, music, writing, and game design here and there, but I wouldn't say I know much of anything about any of them, so this should be a learning experience in lots of ways. DIRYOW? is a top-down RPG using rhythm-based combat with a twist -- in addition to the typical static 'beatmap' for each song, both attack and defense will trigger dynamic changes to the beatmap, and the damage you deal or receive depends on how well you can adapt to those changes. Naturally, how you fare in combat will have an effect on how the story progresses, and in turn, the items you acquire, conversations you have, and experiences you go through in the story will change how attack and defense works during combat. Our protagonist has a very, very good memory. So good, in fact, that focusing on the act of remembering changes reality itself around them, manifesting some element of the memory in the present. The effort required, however, is immense for the effect produced, and so they live a mostly ordinary life, give or take the occasional party trick that nobody can quite figure out. There is one thing they just can't seem to remember, though -- where did they hear that song that's always on the tip of their tongue? When a chance encounter gives them a shot at answering that question, they end up finding out much more than they expected about what their memories mean. I'll be writing this game in Unity and deploying to Windows, Mac, and Linux (hopefully -- I don't actually own a Mac to test on). All my assets are going to start as free placeholders, since I'll be learning every other part of the game creation process more or less from scratch, but as of right now I've downloaded Reaper to use as a DAW and Asesprite for pixel art.